27/01/2018: On to Plan C! 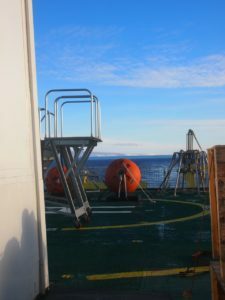 After our outing on to the eastern Getz Ice Shelf, the weather got a bit worse again we continued our way east with more moorings being recovered and deployed and three ocean gliders going in the water. 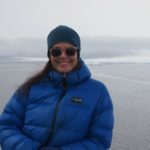 These small autonomous underwater vehicles will spend the next year going in and out of the Dotson Ice Shelf cavity, if everything goes to plan. 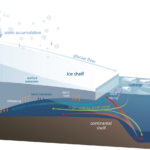 Getting ocean observations in the ice shelf cavities, rather than along their edges like we do with ships and moorings, is difficult. 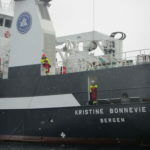 The few observations that exist come from drilling holes through several hundred meters of ice and deploying instruments through them or from sending bigger unmanned submarines into them. 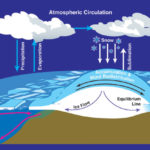 So sending ocean gliders that normally profile the surface ocean into the cavity under the ice shelf is rather daring. 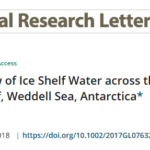 If the project by the University of Washington and Columbia University succeeds, it will mean that we will learn a huge amount about what happens in the ocean under the shelves, but the risk that the ocean gliders do not make it back out is high. Looking across the helicopter deck towards Moore Dome where the weather station was supposed to be deployed. Now that there won’t be any more helicopter operations, other equipment has been moved back on to the helicopter deck. At this point the weather turned good again and we dashed east across the bay to start on the next lot of helicopter work. 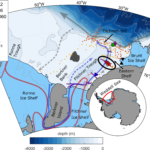 This was to include the replacement of an automated weather station (AWS), and two days of radar and magnetics surveys and ApRES deployments on Thwaites Glacier and Dotson Ice Shelf. We were crossing fingers for 3 days of good weather. The AWS replacement on the first day ended rather abruptly, when the old weather station couldn’t be found and the responsible scientist decided not to replace it with a new one. Preparations for the second day of air operations came to an abrupt halt when a leak in the hydraulic system of one of the helicopters was found. Despite best efforts and extensive spares kits the leak couldn’t be fixed and this spelled the end of any work that needed a helicopter. Two working helicopters are needed for safe operations as an emergency backup, so the fact that one of them was no longer safe to fly meant the other couldn’t fly either. After a brief pause to re-group, on we went with the ocean work on the schedule while considering what could be done with the time that has suddenly become available.